‘Star Wars’ is a simple story, simply told, of good versus evil, light versus darkness, and freedom versus tyranny. In other words it is the story of America’s struggle to preserve democracy and civilization in a world beset by evil and ‘evildoers’. Movies and political propaganda have long walked hand in hand. Indeed if ever a medium was suited to propaganda it is the medium of cinema. And if ever an industry could be credited with creating an alternate reality so pervasive it has managed to convince generations of Americans and others around the world that up is down, black is white, and left is right, that industry is Hollywood. George Lucas, the creator of a Star Wars franchise which, including this latest installment, has churned out seven movies since the original appeared in 1977, is along with Steven Spielberg a child of the reaction to the American counter-culture of the sixties and early seventies. Though both products of the sixties – a decade in which culture and the arts, particularly cinema, was at the forefront of resistance to the US military industrial complex – Lucas and Spielberg came to prominence in the mid 1970s with movies which rather than attack or question the establishment, instead embraced its role as both protector and arbiter of the nation’s morals. The curtain began to come down on the most culturally vital and exciting and cerebral period of American cinema – responsible for producing such classics as ‘Bonnie and Clyde’, ‘MASH’, ‘The Last Detail’, ‘The French Connection’, ‘The Wild Bunch’, ‘Taxi Driver’, ‘Apocalypse Now’ – with Spielberg’s ‘Jaws’ in 1975, followed in 1977 by Lucas’s ‘Star Wars’. The former frightened America, while the latter made it feel good about itself again. Both movies together spawned the high concept blockbuster, wherein audiences were invited to feel rather than to think, allowing them to suspend disbelief and escape reality instead of sharing the experience of confronting it via stories in which alienated characters expressed the angst, frustration, anger, and disaffection which they themselves were experiencing in their own lives, thus inducing a sense of solidarity. It was the era of the anti-hero, main characters for whom the system and conformity was the enemy, and who ploughed their own furrow regardless of the consequences. The questioning of authority and its received truths reflected a country whose young and not so young were hungry for radical change. The war in Vietnam, Watergate, the black civil rights and nationalist movements had shaken up American society and, with it, its culture and cultural references. But by the mid seventies, with the end of the Vietnam War, and with the counter culture running out of steam, the time had arrived to box up all that alienation, anger and rebelliousness and allow the mythology of the American dream and democracy to reassert its dominance. This march to the center became a march to the right under Reagan, which manifested in Hollywood as artistic and cultural stagnation, wherein directors such as Spielberg and Lucas became less concerned with story and character and more focused on spectacle. Bigger, louder and richer was the mantra as two dimensional characters and plotlines that your average ten year old with a set of crayons and an imagination could come up with predominated. In this latest Star Wars movie, directed by J J Abrams, Lucas makes do with a writing credit after selling the franchise to Disney in 2012 for $4.05 billion. Yes you read that right; he sold it for $4.05 billion. That kind of money will buy you a lot of light sabres. Disney and Abrams have reached back in time in order to refresh the franchise, returning it to its roots with the return of Han Solo (Harrison Ford), Princess Leia (Carrie Fisher), Luke Skywalker (Mark Hamill), and the old iconic favourites Chewbacca and R2D2. For Star Wars buffs there’s even the return of Han Solo’s iconic spaceship the Millennium Falcon. 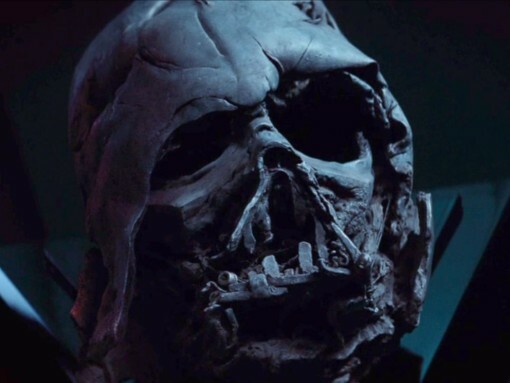 The movie’s antagonist, its Darth Vader, is named Kylo Ren, played by Vladimir Putin…sorry Adam Driver. With this character lies the one interesting twist in the plot. Mind, having said that, we’re talking ‘interesting’ relative to the rest of the plot. We’re not talking Roman Polanski and ‘Chinatown’ here. There are also major roles in the movie for two relative unknowns, both British: Rey, through whose eyes the narrative unfolds, is played by Daisy Ridley, while Finn is played by John Boyega. For all the hype surrounding its release, and the rave reviews it has garnered, the latest instalment of the long running and inordinately successful Star Wars franchise – ‘Star Wars: The Force Awakens’ – is so embarrassingly and toe-curlingly clichéd it’s impossible to walk out afterwards without limping. Perhaps the most striking aspect of the movie is not the battle of good versus evil it portrays but the fact that Harrison Ford was reportedly paid 76 times more than newcomer Daisy Ridley to star in it. The 73 year old’s financial package comprised an upfront fee in the region of $20 million plus 0.5 percent of the movie’s gross earnings, which are projected to reach a whopping $1.9 billion. It is proof that the story of America is not good versus evil or light versus darkness at all. It is instead the story of the super rich versus everybody else. With your help, a new law requiring politicians to wear the logos of their corporate donors will be on the ballot in 2016. (ANTIMEDIA) Popular memes calling for politicians to wear the logos of their corporate sponsors have circulated the internet for years, but the suggestion may soon be a reality for California legislators. In the next week, a potential ballot measure, submitted to the Office of the Attorney General in October, is expected to receive title and summary for the 2016 election, meaning its advocates will be able to collect signatures in order to secure its official place on the ballot. The proposed law would require legislators and candidates to sport the emblems of groups that donate money to their campaigns. Clearly we must appreciate our Emperor’s New Clothes? Mind control jackass person of the year: John Kirby. Phew, I am so glad the US brought peace to Syria and all other countries in the area. Thank you USA! As the year comes to an end, there is reason for cheer on the international drug reform front. The global anti-drug regime has been in place for more than a half century now, but the prohibitionist consensus has been crumbling for at least 20 years, and the decomposition continued apace this year. The international treaties that make up the legal backbone of international drug prohibition still stand, but they are under increasing attack at the United Nations, which will take them up again next year. They are increasingly being breached (especially by marijuana legalization at the national and sub-national level) and nibbled away at around the edges by moves like drug decriminalization and some harm reduction measures such as supervised injection facilities. Happy New Year Lada! Keep up the great work, looking forward to your next report. The Earth Shift Report (ESR) idea began when the first two FREE ESRs were released in 2014. It quickly became clear that Earth Shift Reports didn’t fit into the usual FuturisTrendcast format, going far beyond any of my usual articles in scope, idea and size. They were simply too big and too involved for the blog. Each report was more on par with the scope and feel of a book, simultaneously being much more current than any usual book could possibly be. This is understandable – any published book often requires years to get published. I didn’t have this luxury: my reports had to be substantially more relevant to the fast-evolving global situations, which were the target of my writing. When feeding the homeless becomes an act of civil disobedience, Americans have been asleep for far too long. Luckily, however, there are still good people who are willing to defy such arbitrary and ill-conceived laws and ordinances. 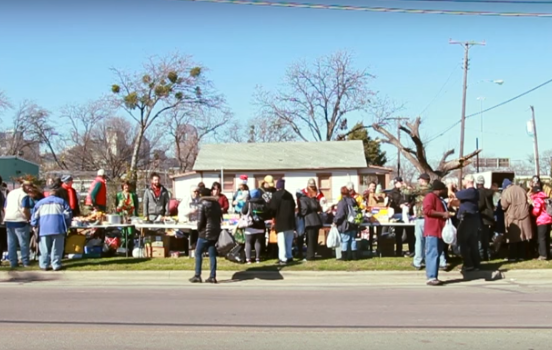 The folks over at the aptly named organization Don’t Comply, took to the streets just outside the Austin Street Shelter in Dallas this weekend to perform, what has now become a revolutionary act – feeding the homeless. Last December, the Dallas city council enacted Ordinance No. 29595, which makes it illegal to serve food to the homeless without jumping through a statist myriad of bureaucratic hoops, including a fee, training classes, and written notices. One should not need to file multiple forms and pay a fee to obtain a permit to give food to those in need who are willingly ready to accept it. The folks at Don’t Comply know this. According to Brett Sanders, hundreds of homeless people showed up to not only enjoy a fantastic array of food, snacks and beverages – but there was also an assortment of winter clothing that was donated as well. “All of the homeless people that I talked to during the event were extremely grateful for the support and there was a sense of humanity that is indescribable. Interacting with other human beings whom most consider to be living life at rock bottom will likely alter your perspective on the world around you,” explained Sanders. Below is the powerful video shot by Brett Sanders showing the powerful effects of such moral civil disobedience. And there were days full of tears. And there were hours in many years. Time ticks and leaves histories. Then the wrongs are corrected. Hatred is difficult to control. But one begins and one ends. But sometimes we miss the good one.